This scene from NASA’s Mars rover Opportunity shows “Wharton Ridge,” which forms part of the southern wall of “Marathon Valley” on the rim of Endeavour Crater. The ridge’s name honors the memory of astrobiologist Robert A. Wharton (1951-2012). The scene is presented in approximately true color. / Credits: NASA/JPL-Caltech/Cornell/Arizona State Univ. NASA’s Opportunity Mars rover will drive down a gully carved long ago by a fluid that might have been water, according to the latest plans for the 12-year-old mission. No Mars rover has done that before. The longest-active rover on Mars also will, for the first time, visit the interior of the crater it has worked beside for the last five years. These activities are part of a two-year extended mission that began Oct. 1, the newest in a series of extensions going back to the end of Opportunity’s prime mission in April 2004. This scene from NASA’s Mars rover Opportunity shows “Wharton Ridge,” on the western rim of Endeavour Crater. The ridge’s name honors the memory of astrobiologist Robert A. Wharton (1951-2012). The scene is presented in enhanced color to make differences in surface materials more easily visible. / Credits: NASA/JPL-Caltech/Cornell/Arizona State Univ. Opportunity begins its latest extended mission in the “Bitterroot Valley” portion of the western rim of Endeavour Crater, a basin 14 miles (22 kilometers) in diameter that was excavated by a meteor impact billions of years ago. 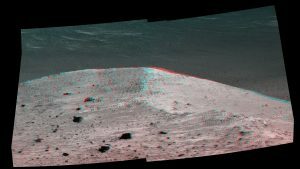 Opportunity reached the edge of this crater in 2011 after more than seven years of investigating a series of smaller craters. In those craters, the rover found evidence of acidic ancient water that soaked underground layers and sometimes covered the surface. This Sept. 21, 2016, scene from the panoramic camera (Pancam) on NASA’s Mars Exploration Rover Opportunity shows “Spirit Mound” overlooking the floor of Endeavour Crater. The mound stands near the eastern end of “Bitterroot Valley” on the western rim of the crater, and this view faces eastward. / Credits: NASA/JPL-Caltech/Cornell/Arizona State Univ. The gully chosen as the next major destination slices west-to-east through the rim about half a mile (less than a kilometer) south of the rover’s current location. It is about as long as two football fields. The rover team will face challenges keeping Opportunity active for another two years. Most mechanisms onboard still function well, but motors and other components have far exceeded their life expectancy. Opportunity’s twin, Spirit, lost use of two of its six wheels before succumbing to the cold of its fourth Martian winter in 2010. Opportunity will face its eighth Martian winter in 2017. 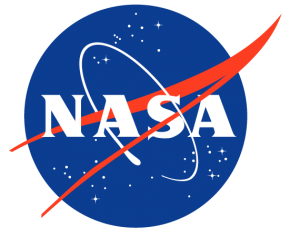 Use of Opportunity’s non-volatile “flash” memory for holding data overnight was discontinued last year, so results of each day’s observations and measurements must be transmitted that day or lost. 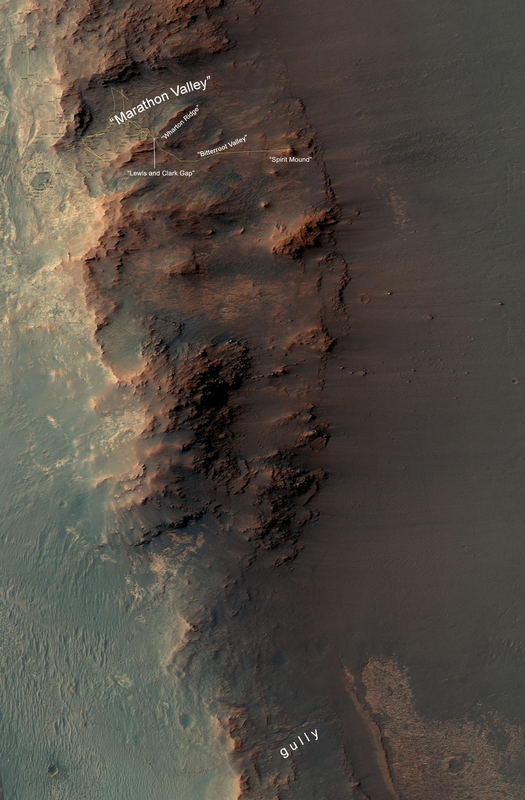 In the two-year extended mission that ended last month, Opportunity explored the “Marathon Valley” area of Endeavour’s western rim, documenting the geological context of water-related minerals that had been mapped there from orbital observations. Last month, the rover drove through “Lewis and Clark Gap,” a low point in the wall separating Marathon Valley from Bitterroot Valley. 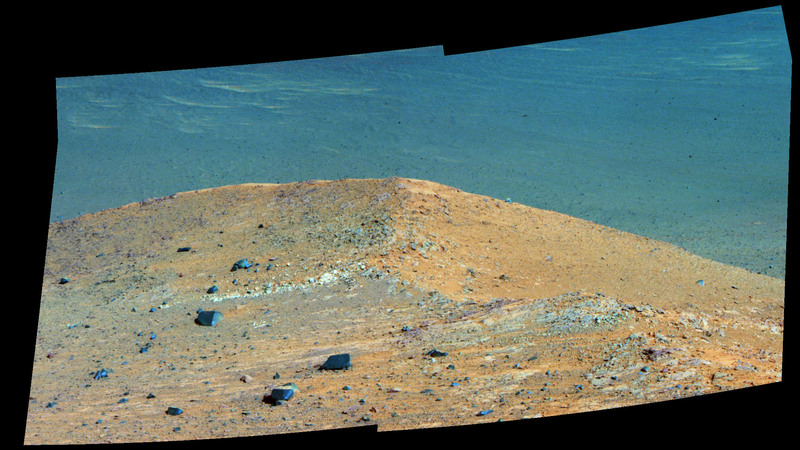 A recent color panorama from the rover features “Wharton Ridge,” which extends eastward from the gap. This week, Opportunity is investigating rock exposures next to “Spirit Mound,” a prominent feature near the eastern end of Bitterroot Valley. The third main science goal of the new extended mission is to find and examine rocks from a geological layer that was in place before the impact that excavated Endeavour Crater. The science team has not yet determined whether the mound area will provide rocks that old. This map show a portion of Endeavour Crater’s western rim that includes the “Marathon Valley” area investigated intensively by NASA’s Mars Exploration Rover Opportunity in 2015 and 2016, and a fluid-carved gully that is a destination to the south for the mission. / Credits: NASA/JPL-Caltech/Cornell/Arizona State Univ.